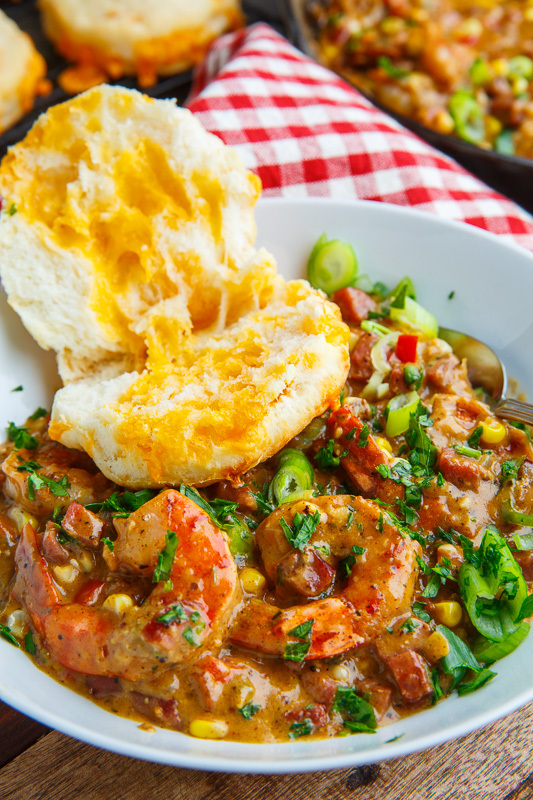 Biscuits and gravy Cajun style with a tasty shrimp and andouille sausage gravy! Biscuits and gravy is a classic dish and a recipe that I have just been itching to share! 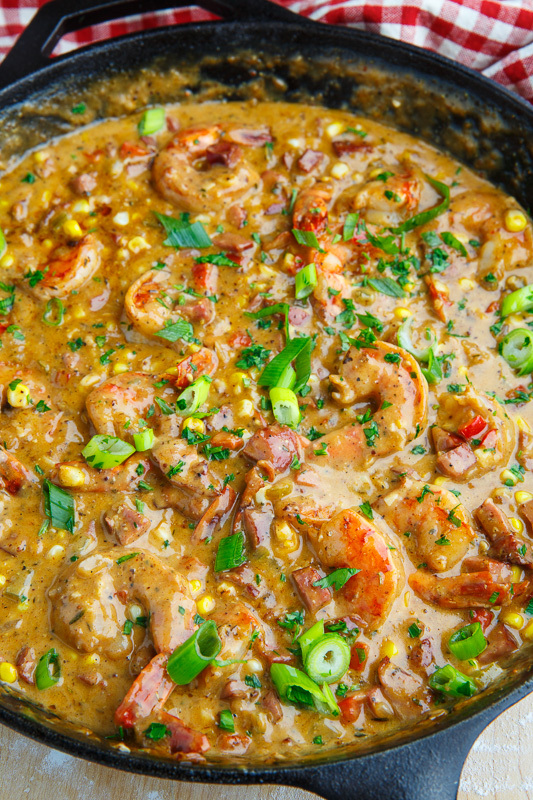 I was all set to make it and I had an idea, what about a cajun style version with a shrimp and andouille gravy? Essential to any good biscuits and gravy is the biscuits, which should be nice and light and fluffy, moist and tender! These biscuits are so easy to make! You simply pulse the butter and flour in a food processor, mix in the buttermilk and cheese and bake in the oven until the are nice and golden brown! I am so into the addition of cheddar to biscuits like this, especially straight from the oven while the cheese is still melted, ooey and gooey! The gravy starts out with bacon which is cooked and set aside before using the bacon drippings to cook the sausage and shrimp in. Butter is then added to cook the veggies followed by a bit of flour to make sure that the gravy is nice and thick. The gravy is filled out with broth and cream and seasoned with cajun seasoning, bay seasoning, mustard and Worcestershire sauce. What a tasty gravy; and it’s so good smothering freshly baked cheddar biscuits! 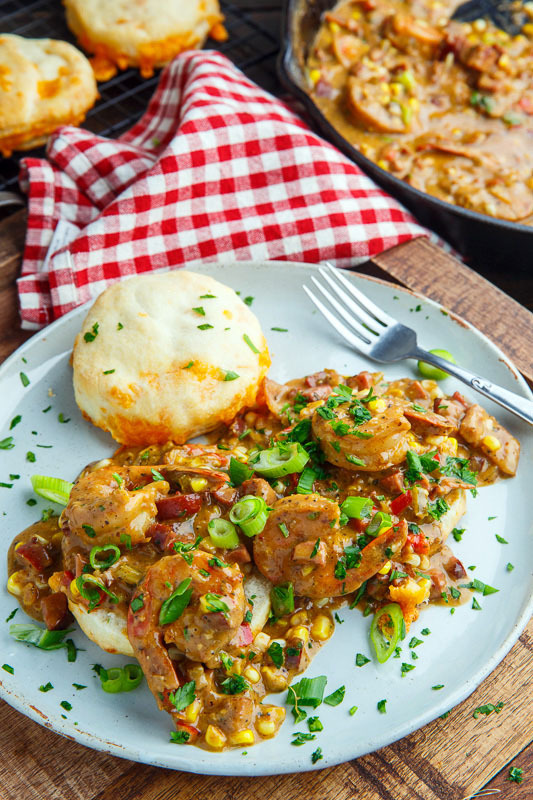 These cheddar biscuits and shrimp and andouille gravy are a fabulous take on the classic biscuits and gravy! Cook the bacon in a large pan and set aside. Adding the sausage and cook until lightly golden brown and slightly crispy and setting aside. Add the shrimp and cook until pink, about 1-2 minutes per side before setting aside. Add the onion, pepper and celery and cook until tender, about 7-10 minutes, before adding the corn and cooking for 2-3 minutes. Mix in the garlic, thyme and flour and cook until the flour starts to brown a bit, about 2-3 minutes. Add the broth and deglaze the pan by scraping the brown bits up off of the bottom of the pan with a spoon as the broth simmers. Add the cream, sausage, cajun seasoning, bay seasoning, mustard and Worcestershire sauce, bring to a boil, reduce the heat and simmer until the sauce thickens to a gravy, about 3-5 minutes. 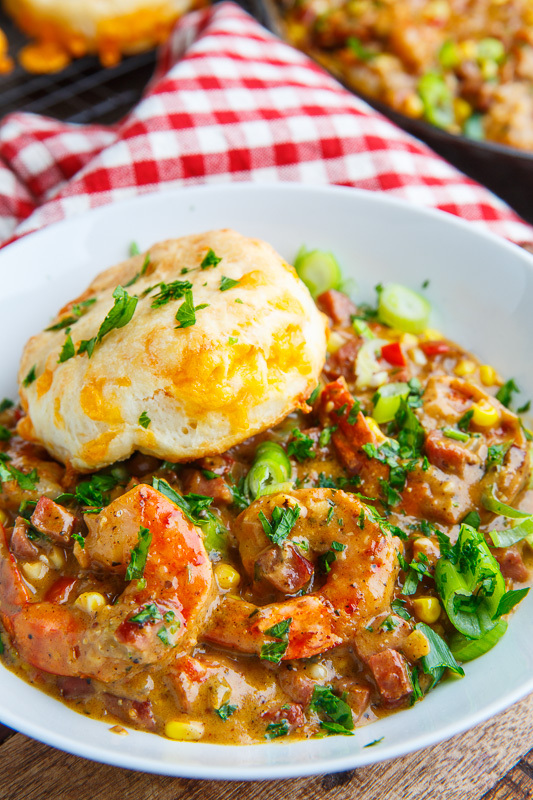 Mix in the bacon, shrimp, green onions and parsley and serve on top of the freshly baked biscuits. Option: Simmer the shrimp shells in the chicken broth for 10 minutes before straining the solids out to add more shrimp flavour! 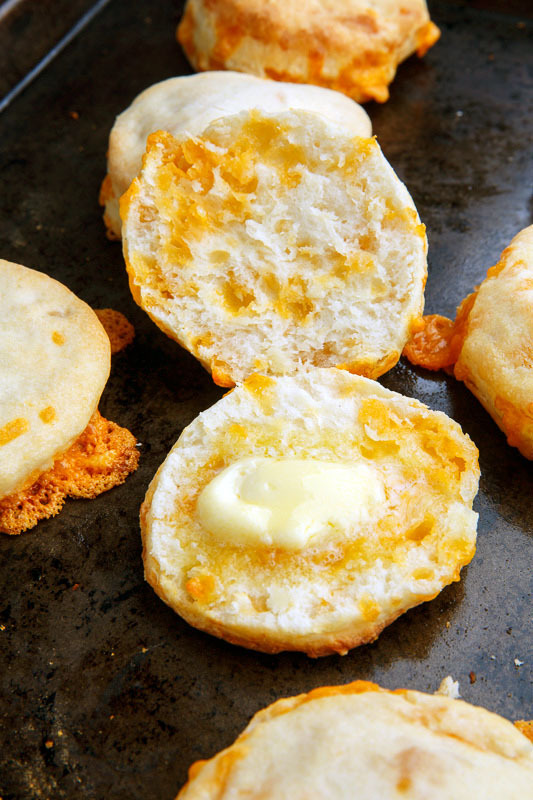 Light and flakey buttermilk biscuits with plenty of melted cheddar cheese! Process the flour, baking powder, sugar, salt and bitter in a food processor until it forms sand like grains. Gently mix in the buttermilk and cheddar until it forms a dough. Form the dough into the desired shape, place on a baking sheet, and brush with the egg mixture before baking in a preheated 425F/220C oven until lightly golden brown, about 10-15 minutes. Oh Kevin, this sounds and looks divine. Thanks for sharing. I must try it sometime soon. Looks delicious. Would like to try recipe. Is it 1072 calories per serving? This looks amazing. What is cajun mustard, I've never heard of it before. This is a delicious recipe for sure. I'd love to eat biscuits that way with shrimp and andouille sausage. Thanks very much for the recipe. Oh my, but this is good! 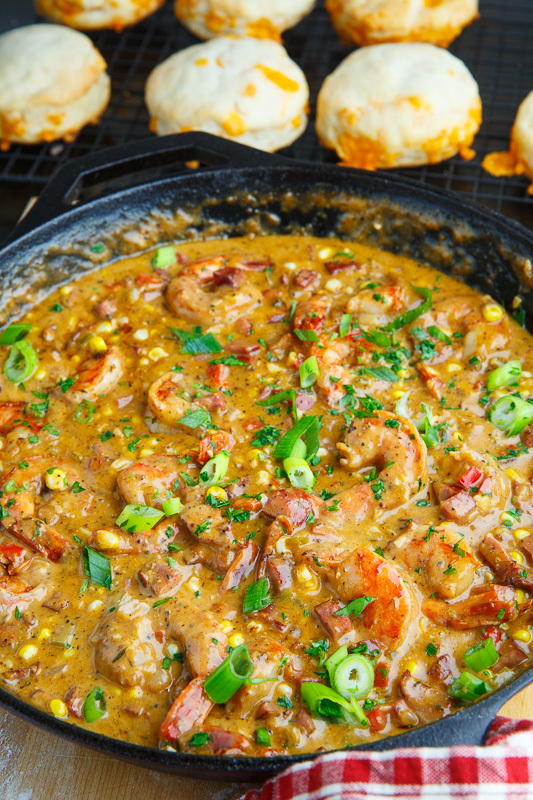 As a native New Orleanian, though, I prefer it served the traditional way — over rice. The biscuits are also wonderful; I added minced green onion the second time I made them. For the person asking about Cajun mustard, I’m a tad mystified. 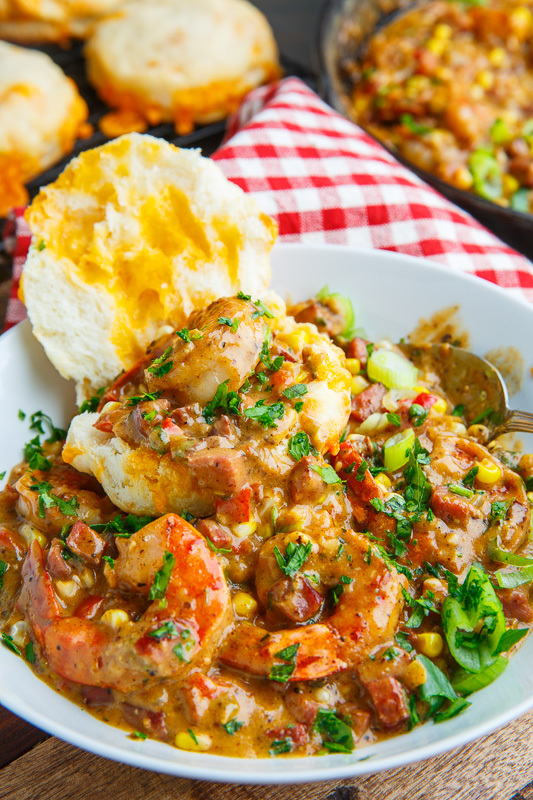 Many people have the tendency to use the words “Creole” and “Cajun” interchangeably, although they are distinct cultures, foodways, and cuisines. I have never, in my 65 years, heard of “Cajun mustard,” and despite spending considerable time food shopping in Lafayette, Breaux Bridge, etc., I’ve never come across a Cajun brand of mustard. I’m wondering if this chef is referring to Creole mustard, a coarse grind brown mustard like the Zararains brand. You can find Zat’s easily online if it’s not in your local market, or you can substitute any of the German brands or style brands that are similar and get a good result. Bon appetit! This site has wonderful recipes, and i’m grateful for the generosity and caring that goes into this labor of love. In NOLA, all occasions are celebrated over good food, and a well-prepared meal is an act of love to share with those we care for. The recipe was delicious but a little too salty. I went back and looked at your instructions and see that you make your own creole seasoning ! I will definitely be trying that the next time!